About Us - Local & National Electrician, Electrical Contractor, Electrician In - Stirling, Alloa, Falkirk, Glasgow, Edinburgh, Scotland. Established in 1996 Stirling Electrical Services Ltd. are an electrical and security system company carrying out domestic, commercial and industrial work for clients both locally in Stirling, Falkirk and Alloa as well as nationally throughout all regions of Scotland. Our team of BS7671 qualified engineers, electricians and apprentices carry out fault finding, installation, maintenance, inspection and testing services while our experienced office staff are on hand to deal with your initial job enquiry through to job completion to ensure we uphold the 'Professional Efficient Service' we promise. We are an approved member of SELECT and are a Which? Trusted Trader. In February 2016 our branded intruder security alarm service Stirling Alarms was accredited with the leading UK security system governing body the National Security Inspectorate (NSI). We are accredited to the highest security system level NSI NACOSS GOLD and we operate at BS EN ISO 9001:2015 level meeting the requirements of NSI SSQS 101, NSI NCP 109, NSI NCP 104, PD 6662:2010/IA 1501:2015 and BS 7858:2012. We are also a founding member of the UK wide Buy With Confidence Scheme which is operated locally by the Trading Standards departments at Stirling and Clackmammanshire Councils. Our branded Security Alarm service is named Stirling Alarms. We are also an approved member of the Local Authority Scotland Building Warrant Scheme and we employ Approved Certifiers of Construction (Electrical Installations to BS7671). 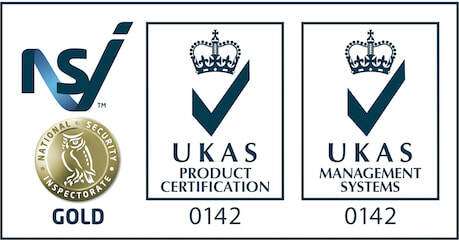 Please see our accreditation page for more details.